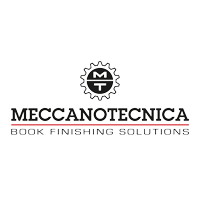 Meccanotecnica will present the new Universe Web, automatic folding and book-sewing line, to produce thread sewn books directly from the printed roll. The solution will be showcased connected to Inline, modular and multifunctional back gluer and Trimming, the new automatic three-knife trimmer. Inline, modular and multifunctional back gluer, will show an improved Nipping station, designed to ensure the pressing of books up to 4.000 kg. The process reduces the thickness of the block and forms a squared spine, allowing the production of higher quality books. The line will show its multifunctional capabilities by producing during the event paperbacks with the application of the softcovers and blocks ready for the hardcover application with end-sheets and gauze. Trimming, the new compact three-knife trimmer, offers high-quality cutting and manages a wide range of sizes. It will be presented with a completely redesigned software interface and monitor together with improved motion devices. During the event, thousands of high-quality books will be produced in collaboration with the major vendors of digital presses. The aim is to show digital printers how to produce premium quality books by combining the amazing print quality of the new generation continuous feed inkjet presses and the intrinsic quality of Meccanotecnica’s thread sewn books. Hunkeler innovationdays is the must-attend industry event for digital printing and finishing. The world’s best manufacturers will meet to present the next generation of high-performance technology for digital. In this regard, Meccanotecnica will present the Universe Web as a worldwide premiere and the new upgrades of Inline and Trimming.